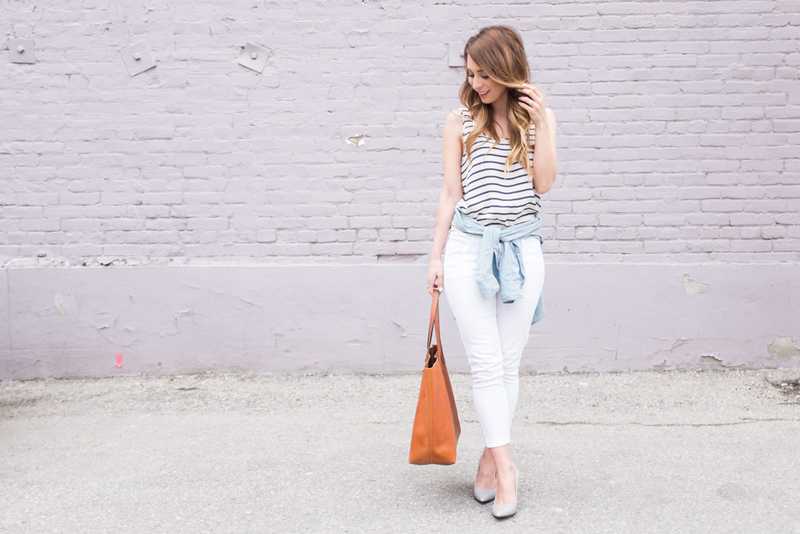 OOTD - Stripes For Spring | La Petite Noob | A Toronto-Based Fashion and Lifestyle Blog. If there's one pattern that I think is universally flattering, it's got to be stripes. Wearing stripes adds such a clean element to any outfit, and instantly gives your outfit a more classic feel. 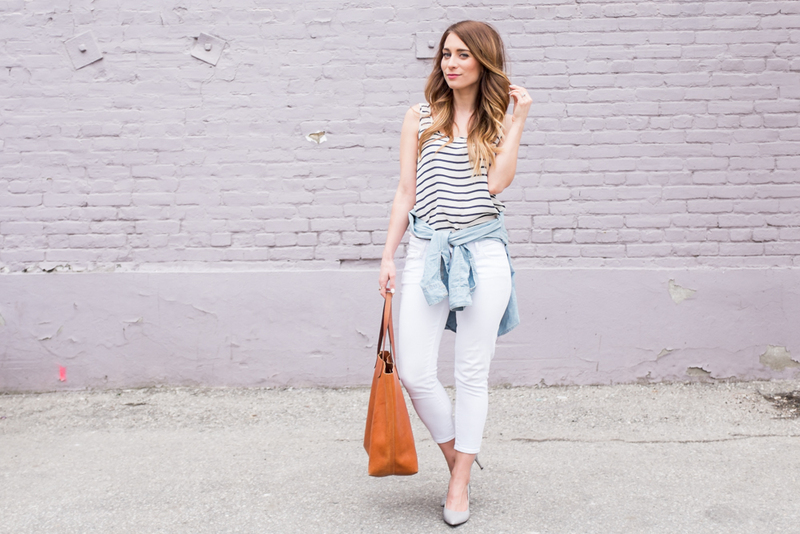 Keeping with my white jean obsession this spring, I paired them with my favourite striped tank and chambray shirt. The results were fresh, and perfect for the sunshine and warm weather that we're experiencing. What do you guys think? Are you into stripes as much as I am, or do you have another favourite pattern? Has the weather warmed up in your area? Let me know! I'm totally with you - you can't go wrong in stripes. Love this look on you, but you totally have me dreaming of summer! This weekend definitely felt like summer! I could definitely do with more of that weather! Such a good pairing. 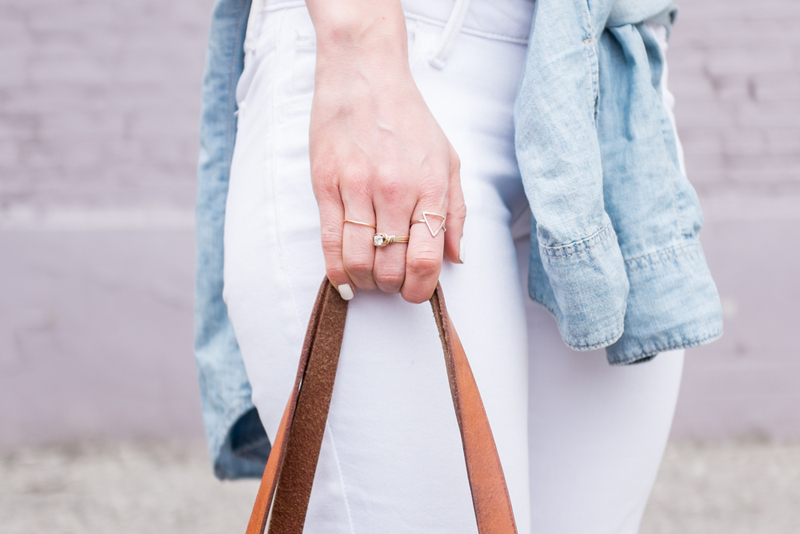 The colour of those heels are perfect with the white denim! And every time I see you wear that bag I swoon! Love! Thanks Gabriella! I love this bag too - definitely just getting better with age! I'm with you girl! Stripes are the most flattering pattern out there. Timeless classic!